The purpose of the six thinking hats is to unscramble thinking so that a thinker is able to use one thinking mode at a time – instead of trying to do everything at once. 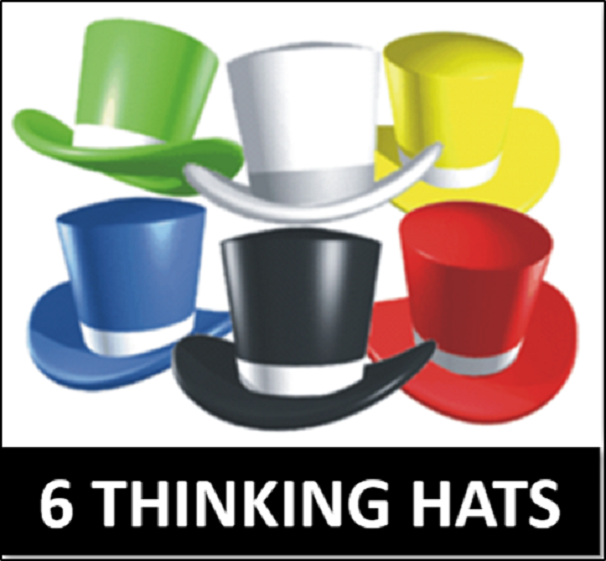 The six thinking hats method is designed to switch thinking away from the normal argument style to a mapmaking style. They provide a formality and a convenience for requesting a certain type of thinking either of oneself or of others. They establish rules for the game of thinking. Anyone playing the game will be aware of these rules. The great value of the hats is that they provide thinking roles. A thinker can take pride in playacting each of these roles. The essence of each hat is easy to remember. 1. White Hat - virgin white, pure facts, figures and information. 2. Red Hat - seeing red, emotions and feelings, hunches and intuition. 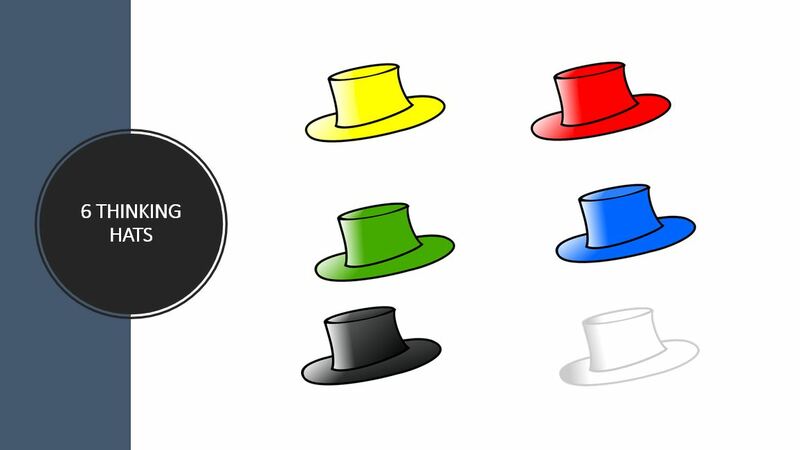 Explain the meaning of the six thinking hats. Explore the uses of the six thinking hats. Decide the best choice of hats to use in different situations. Role play and play act the use of different hats for a particular situation. Apply the six thinking hats in different situations, problem solving, process improvement and solution finding. Develop creative and innovative solutions to a wide range of problems and challenges, both at work and in real life. Interactive Mini-lectures, Active Learning & Training Techniques, NLP, Brain Rules, Multiple Intelligences, Brain Energisers, Cooperative & Collaborative Learning, Whole-Brain Learning & Thinking, Knowledge Mapping, Applied Positive Psychology & Cognitive Neuroscience, Brain Aerobics for Optimum Performance, Problem-Based Learning, Structured Experiential Learning Exercises, Super Learning Environment, Role Plays, Games & Simulation & Performance Coaching, Team Presentations, and GameStorming for FUN sessions.